(Church calendar - Jun 24) Synaxis of Saints of St. Petersburg (movable feast on the 3rd Sunday of Pentecost). Saint Philaret (Drozdov) was born on December 26, 1782 in Kolomna, a suburb of Moscow, and was named Basil in Baptism. His father was a deacon (who later became a priest). The young Basil studied at the Kolomna seminary, where courses were taught in Latin. He was small in stature, and far from robust, but his talents set him apart from his classmates. In 1808, while he was a student at the Moscow Theological Academy at Holy Trinity Lavra, Basil received monastic tonsure and was named Philaret after Saint Philaret the Merciful (December 1). Not long after this, he was ordained a deacon. In 1809, he went to teach at the Theological Academy in Petersburg, which had been reopened only a short time before. Hierodeacon Philaret felt ill at ease in Petersburg, but he was a very good teacher who tried to make theology intelligible to all. Therefore, he worked to have classes taught in Russian rather than in Latin. Philaret was consecrated as bishop in 1817, and was appointed to serve as a vicar in the diocese of Petersburg. He soon rose to the rank of archbishop, serving in Tver, Yaroslavl, and Moscow. In 1826, he was made Metropolitan of Moscow, and remained in that position until his death. The Metropolitan believed that it was his duty to educate and enlighten his flock about the Church’s teachings and traditions. Therefore, he preached and wrote about how to live a Christian life, basing his words on the wisdom of the Holy Fathers. His 1823 CATECHISM has been an influential book in Russia and in other countries for nearly two hundred years. The reforms of Tsar Peter the Great had abolished the patriarchate and severely restricted the Church, placing many aspects of its life under governmental control. Metropolitan Philaret tried to regain some of the Church’s freedom to administer its own affairs, regarding Church and State as two separate entities working in harmony. Not everyone shared his views, and he certainly made his share of enemies. Still, he did achieve some degree of success in effecting changes. One day, Archimandrite Anthony (Medvedev), a disciple of Saint Seraphim of Sarov (January 2), paid a call on his diocesan hierarch. During their conversation, Father Anthony spoke of the patristic teaching on unceasing prayer, and he may have told the Metropolitan something of Saint Seraphim. Saint Philaret felt a deep spiritual kinship with Father Anthony, who soon became his Elder. He made no important decision concerning diocesan affairs, or his own spiritual life, without consulting Father Anthony. Saint Seraphim once told Father Anthony that he would become the igumen of a great monastery, and gave him advice on how to conduct himself. It was Saint Philaret who appointed him as igumen of Holy Trinity Lavra. Metropolitan Philaret wanted to have the Holy Scriptures translated into modern Russian, so that people could read and understand them. 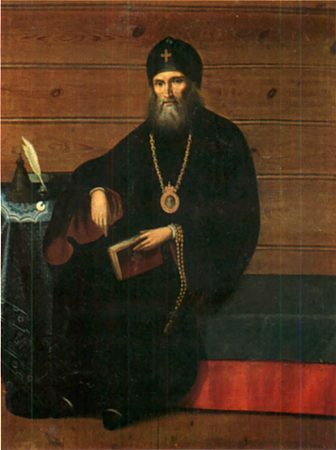 Father Anthony, however, criticized the unorthodox ethos of the Russian Bible Society, which was popular during the reign of Alexander I. In his eagerness to have the Bible translated into modern Russian, Saint Philaret at first supported the Bible Society without realizing how dangerous some of its ideas were. The first Russian translation of the Bible was printed during the reign of Tsar Alexander II. Under the direction of his Elder, Metropolitan Philaret made great progress in the spiritual life. He also received the gifts of unceasing prayer, clairvoyance, and healing. It is no exaggeration to suggest that Saint Philaret himself was one of the forces behind the spiritual revival in nineteenth century Russia. He defended the Elders of Optina Monastery when they were misunderstood and attacked by many. He protected the nuns of Saint Seraphim’s Diveyevo Convent, and supported the publication of patristic texts by Optina Monastery. Metropolitan Philaret was asked to dedicate the new Triumphal Gate in Moscow, and Tsar Nicholas I was also present. Seeing statues of pagan gods on the Gate, the Metropolitan refused to bless it. The Tsar became angry, and many people criticized the saint’s refusal to participate. He felt that he had followed his conscience in this matter, but still felt disturbed by it, and so he prayed until he finally dropped off to sleep. He was awakened around 5 A.M. by the sound of someone opening the door which he usually kept locked. The Metropolitan sat up and saw Saint Sergius of Radonezh (September 25) leaning over his bed. “Don’t worry,” he said, “it will all pass.” Then he disappeared. Two months before his death, Saint Philaret saw his father in a dream, warning him about the 19th day of the month. On November 19, 1867, he served the Divine Liturgy for the last time. At two in the afternoon, they went to his cell and found his body. He was buried at Holy Trinity Lavra. Saint Philaret was glorified by the Russian Orthodox Church in 1995. Having acquired the grace of the Holy Spirit / O divinely wise and holy hierarch Philaret, / You preached truth and righteousness to the people with enlightened understanding; / With a contrite heart you showed peace and mercy to the suffering; / And as a teacher and tireless guardian of the Faith / With the staff of uprightness you preserved the Russian flock. / Therefore, as you have boldness before Christ our God, / Pray that He preserve the Church and salvation to the people and our souls. As a true imitator of the venerable Sergius; / You loved virtue from childhood, O divinely blessed Philaret. / As a righteous pastor and blameless confessor, you were subject to mockery and abuse by the ungodly after your holy repose, / But God has glorified you with signs and miracles / And shown you to be the helper of our Church.